Just a quick Post of the Day this Saturday morning, as I came across yet another “news” article that continues to propagate yet another false use-of-force narrative by the racial grievance industrial complex. This “news” post was by the Daily Memphian, whose catchphrase is—I kid you not—”truth in place.” The “journalist” is one Yolanda Jones, whom the Daily Memphian tells us “covers criminal justice issues and general assignment news. Three police officers were involved in a traffic stop of a 25-year-old black male by the name of Martavious Banks. The officers involved report that Banks appeared to reach for a gun. Indisputable is that Banks sped from the stop until he crashed into a curb at which time he abandoned the vehicle and fled on foot, pursued by the officers. At one point, one of the officers shot and killed Banks. A departmental review found no criminal misconduct by the officers, nor any evidence that they misused force in any way. The review did, however, find certain violations of police procedure involving the use of police radios and body cameras. One consequence of these procedural violations is that one of the officers involved has just resigned. Incidentally, of the three officers involved in this incident, two were themselves black males. The third was a white male. The Banks family has hired Baltimore attorney Billy Murphy. Murphy represented the family of Freddie Gray, a 25-year-old African-American man killed by Baltimore police in 2015. Murphy won a $6.4 million settlement for Gray’s family against the city of Baltimore. Did you catch the false narrative tossed into that last paragraph? “… Freddie Gray, a 25-year-old African-American man killed by Baltimore police in 2015.” Well, well, well, a racially divisive lie being propagated by a “news” “journalist”—here’s my #shockedface. There is literally zero evidence that anyone on the Baltimore PD “killed” Freddie Gray or indeed used any unlawful force upon Gray at all. If you claim otherwise, specify that evidence. There’s a good reason that every officer charged in Gray’s death was either acquitted at trial (by a black trial judge) or had their charges dismissed (by black State’s Attorney Marilyn Mosby), and was fully restored to duty after a comprehensive departmental review (by a department led at the time by a black Police Chief). Contrary to this utterly unsupported claim of a police “killing,” all the evidence at trial was consistent with the theory that Gray’s neck injury was suffered when he foolishly stood up in the back of the moving police van while his feet and hands were shackled, falling when the van made a normal change in direction, striking his head and causing his own neck injury. 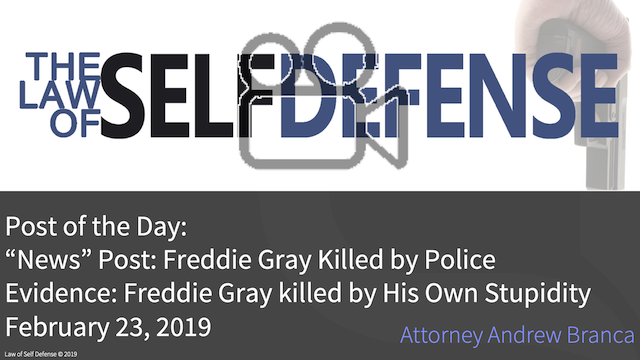 Indeed, the original medical examiner’s report described Gray’s injury as similar to a “shallow diving accident,” which would be the case if Gray were to fall and strike his head within the confines of the police van. That’s right–the actual evidence suggests that Freddie Gray was most likely killed by his own stupidity. Separately, if anyone is wondering if the fact that the Freddie Gray family was awarded a $6.4 million settlement by the City of Baltimore means that surely there must have been some misconduct involved, think again. In awarding this money the City of Baltimore is spending other people’s money—the taxpayer’s money—and all the people arriving at the decision are politicians who are elected to their positions and presumably want to be re-elected. It is thus a purely political decision to make such a payment, not a finding on the merits. It’s worth asking ourselves, I think, why the media is so absolutely determined to propagate factually and demonstrably false racist narratives in order to foster hatred between black and white Americans. Is it because they wish our country well—that would seem unlikely, no? Or is it because they believe the falsely propagating racial hatred among Americans will sell more “news”? Thanks for the information. You never see this kind of story after the fact. I continue to be disgusted on a daily basis by the stupidity and partisanship of the media.